Creamy Avocado Greek Yogurt Chicken Salad- a healthy spin on chicken salad with no mayonnaise involved! I haven’t been this excited to share a recipe with you in a while! Today we’re talking chicken salad, and specifically, mayo-free, creamy avocado Greek yogurt chicken salad. I bought a rotisserie chicken with no real plan other than maybe using it on salads for dinner, and I happened to be talking to my mom on the phone while I was at the grocery store. When she suggested making chicken salad, it sounded great except for one thing: I really dislike mayonnaise. I can just barely tolerate mayo in chicken salad, but there was no way I was going to buy a whole jar of it, especially since it’s not the healthiest condiment out there. So, I started brainstorming what I could substitute for mayo that would add a similar creaminess to the salad. My first thought was plain Greek yogurt…and then I thought of avocado, too. 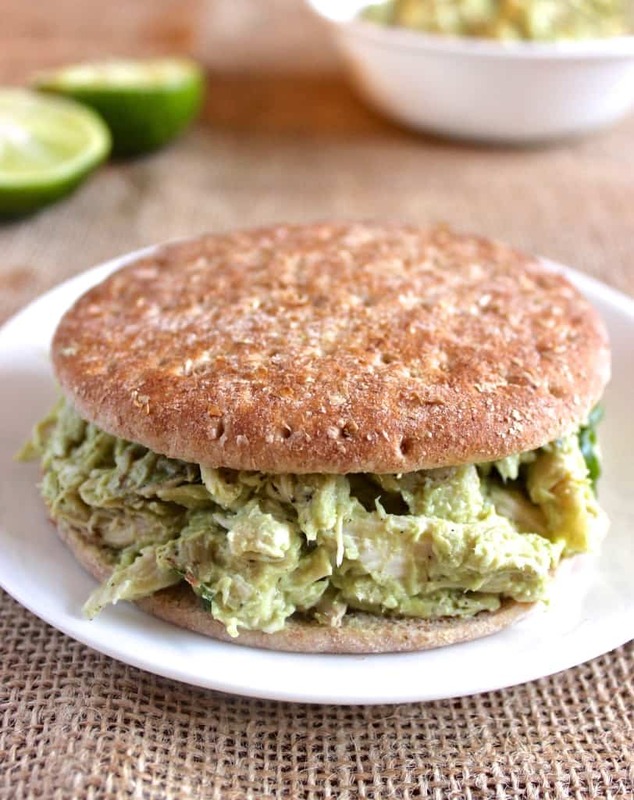 So, I came up with a simple recipe that combines shredded chicken, avocado, plain Greek yogurt, lime juice, red onion, and cilantro for a healthy and unique alternative to the traditionally mayo-heavy chicken salad. My only concern was that the avocado would quickly turn brown, which would make the chicken salad look less appetizing, even though it’d still taste the same. I ate my avocado Greek yogurt chicken salad over the course of three days, though, and there was no brown avocado to be seen. Maybe the lime juice worked some magic! After making the recipe and calculating the nutritional info, I was surprised by how great the stats are. One serving of this avocado Greek yogurt chicken salad has 26 grams of protein with only 200 calories. On a piece of whole-grain bread or a sandwich thin, or even straight up with a spoon, this chicken salad makes a perfect lunch to pack for work, school, or a picnic. If you try this avocado Greek yogurt chicken salad, leave a comment and a star rating or take a photo and tag me @livbane on Instagram! A healthy spin on chicken salad with no mayonnaise involved! Stir together shredded chicken, mashed avocado, plain Greek yogurt, and lime juice. If mixture seems dry, add another spoonful of Greek yogurt. Add diced red onion, salt, pepper, garlic powder, and cilantro, and stir to combine. Taste to adjust spices to your preference. Serve on wheat bread or a sandwich thin, with crackers, or enjoy by itself. I used a small rotisserie chicken to save time. To tell if an avocado's ripe, gently squeeze it. It should feel just slightly squishy. I might be drooling over this. Thankfully, I have some avocado packed in my lunch today, so that should hold me over until I can give this a try! I can’t believe I used to be an avocado hater- they’re SO good! Yum! What a perfect balance of healthy fats and protein! I just made a similar recipe to this, but a tuna salad instead and that avocado just does wonders to it!! I try not to eat a lot of mayo and usually sub it with hummus, but avocado just might be my new go-to for it! My roommate for the summer loves tuna and has been eating it a lot- I wish I could get behind it, but I just can’t get over the fishiness! Liv, you’re brilliant! I use Greek yogurt in chicken salad, but sometimes it tastes a little too Greek yogurt-y. I love, love, love avocados, so I’m going to have to try this! Do you think that combo would be good in egg salad as well, or do you think that would taste weird? Do you think you could sub the Greek yogurt for cottage cheese? I’d actually gone probably 5+ years without eating chicken salad because of my aversion to mayo, so I’m so happy it’s back in my life! If i went to a regular supermarket would i still be able to use their rotisserie chicken? I don’t have Earth Fare close to me since i don’t have a car at the moment. Soo I haven’t had the chance to eat breakfast yet and I am DROOLING. Like seriously, I am actually hungry because of this post and as soon as I finish typing this, I’m heading over to the kitchen to find something to take the edge off ;). Chicken salad is one of my absolute favorite lighter meals and I love that this incorporates healthy fats instead of the traditional mayo! Oh gosh this looks so good! I always have such a problem being patient and waiting for my avocado to ripen so I can use it in recipes haha! Today I actually made something similar with tuna! I worked for Chi-Chi’s for many years. They ripened avocados by placing them in a brown paper bag with tomatoes. The gases from the tomatoes ripened them quicker. Oh I’ve been trying to find new ideas for the boy, he’s so tired of his everyday eats. I’m going to recommend this to him!! Oh yay! I hope he gives it a try and enjoys it 🙂 I completely understand those everyday food ruts! Agh what a killer combo! I love using Greek yogurt in my tuna salads. 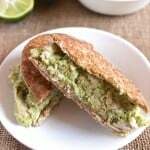 Adding avocado is a great idea that I’m sure adds unbeatable richness (while still being healthy!). It’s crazy to me how rich avocado is! I haven’t tried it yet, but I can definitely see how it would work well for chocolate avocado mousse recipes! This looks delicious!! I could happily live off tuna or chicken salad for lunch. Huh, I’ve never thought of avocado as a substitute for mayo, but that’s an awesome idea! Tuna salad always grossed me out because I don’t like fish, but your chicken version sounds really good. I’m not huge on mayo, either, so I usually use a combo of Greek yogurt and mayo in tuna/chicken salads. LOVE this idea even more, though! It also reminds me (very loosely) of Trader Joe’s Greek yogurt guacamole, which is pretty fantastic. Excellent idea! It’s crazy how rich avocado is! I haven’t tried it yet, but I can definitely see how it would work well for chocolate avocado mousse recipes! Protein-rich and avocado ridden … I definitely must try this! Lovely photos! lime and/or lemon juice is the BEST for keeping avocados looking fresh. this looks super yummy! i personally LOVE mayo but would also substitute Greek yogurt and never know the difference! I have made a recipe very similar to this one recently for a client’s website. One trick I did?…I used lime greek yogurt in the recipe. Crazy, right?! It actually worked well! It’s such a refreshing sandwich filling–particularly for Summer. I absolutely HATE mayo! I’ve never even tried traditional chicken salad bc I dislike it so much. I like that your recipe uses diff ingredients! I just may have to give this a try! This looks amazing! I bet it was the lime juice that stopped it from going brown indeed, defjnitely makes for a more pleasant eating experience when it’s not going that weird brown colour! I love the green colour and I would totally use a rotisserie chicken too, I don’t have an oven so that’s my only option haha. Have a great day Liv! I can’t imagine avocado, chicken and yogurt mixing together. I’m curious how its taste. Thank you for sharing this no so usual recipe, I’ve been browsing your site for quite some time to look for more new recipes. Such an amazing recipe! I can not wait to try it! Also thank you so much for stopping by my blog and giving me the encouragement that I needed to get through this really rough patch in my life! It was needed! Also do you know of any link ups or places that I can meet a lot of bloggers besides individually googling them? Haha google comes up with a looot of weird things when I type in Health, fitness, and blog XD! Hey Katerina! One way I’ve found some of the blogs I follow is from scrolling through the comment sections of blogs I already read and enjoy, and I’ll click through to any blogs that sound interesting. As for link-ups, the weekly “What I Ate Wednesday” link-up on peasandcrayons.com can be a great place to find other health and fitness-minded bloggers! This is delicious! The avacado makes it have such a delicious taste. My ladies group loved it. Thanks for this fantastic recipe! I’m so glad to hear that your ladies group enjoyed it, Debbie! This is one of my favorite recipes, as well! This recipe sounds really great but I don’t like the taste of Greek yogurt, so my question is can you really taste the Greek yogurt in it? Hi Emily! I don’t notice the taste of Greek yogurt in this recipe, but you can also substitute plain regular (non-Greek) yogurt if you’d prefer! Both work well. I have been using a little over a pound of shredded cooked chicken breasts (which is about 3 or 4 split breasts…instead of the rotisserie chicken) and then I just adjust the amount of avocado, Greek yogurt and spices that I use to give it the right amount of creaminess and zip. Love the recipe! I added a little bit of buffalo hot sauce to my chicken before mixing it into the avo and it was delicious 🙂 This is a great recipe! You know, I don’t think I would’ve ever thought to add buffalo hot sauce to the chicken before making chicken salad but that sounds amazing!! Glad to hear you enjoyed the recipe, Katie!! Avocado mixes well with the greek yogurt. Friends make fun of me for not being able to cook but luckily this recipe requires no cooking. came out perfect, can’t wait for the kids to come home and try it! I’m so happy to hear you enjoyed this chicken salad, Ann! Hope your kids love it, too! I made this yesterday and instead of cilantro I added dill, it was delicious! I was looking for greek yogurt chicken salad recipes and found this one. So glad I bought avocados yesterday! I’m already excited about lunch tomorrow!!! What perfect timing! Hope you love the recipe, Carol! 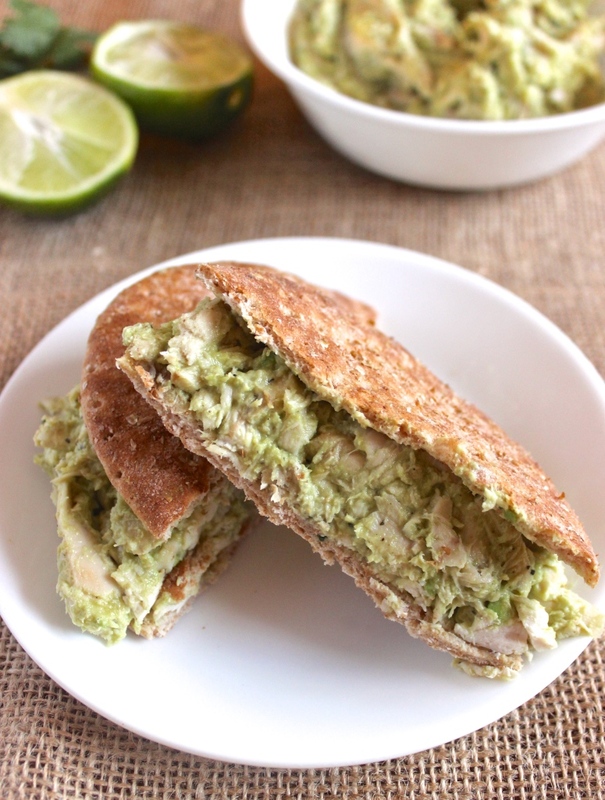 I’m so glad you love this avocado greek yogurt chicken salad, Sarah! It’s one of my very favorite things to have for lunch! SO GOOD! Made this for lunch today – super filling and delicious. I am so here for all the protein and healthy fats. Will definitely be making this again, thank you! I’m so glad you love this chicken salad recipe, Poorvi! It’s one of my favorite lunches, as well. I’m new around here, but this looks absolutely delicious! My question is, how long do you think it will stay good in the fridge? I’m a sophomore in high school and next week I have 4 soccer games as well as my AP US history exam on Friday…yikes! If I could make 5 days worth of this on Sunday and have it throughout the week it would be a huge time saver and eliminate some of my stress, but will it stay good until Friday? Regardless, I definetly want to give this a try! Hi, Karlie! The longest I’ve kept it is 4 days, but I think it tastes best for the first 3 days 😊 I tend to be overly cautious with meat, though, so it may be fine for 5. Good luck with your busy week!!! If you are really lazy or don’t have the actual avacodos on hand , you might try the packaged Guacamole. The ingredients are Hass avacodos, jalapeño purée, white vinegar, jalapeños, dehydrated onions dehydrated red bell pepper salt, and garlic. It mixes well with the recipe without the yogurt and avacodos.